The local authority must set out in their Local Offer an authority-wide description of the educational and training provision children and young people with SEN or disabilities can expect to be provided from the funding provided to providers of relevant early years education, schools and the full range of post-16 providers in their area. Schools have additional duties under the Special Educational Needs and Disability Regulations 2014. Schools must publish more detailed information about their arrangements for identifying, assessing and making provision for pupils with SEN. The information must also include information about the arrangements for the admission of disabled pupils, the steps taken to prevent disabled pupils from being treated less favourably than other pupils, the facilities provided to assist access for disabled pupils and the schools’ accessibility plans. The school-specific information should relate to the school’s arrangements for providing a graduated response to children’s SEN. It should elaborate on the information provided at a local authority wide level in the Local Offer. To comply with the new code of practice, all schools need to publish details of their individual offer of support for children and young people with SEND, in line with the expectations of the local authority, from 1st September 2014. At The Forest Academy, excellence is achieved through the delivery of an inclusive curriculum, taught in a modern, well-resourced and stimulating environment by passionate, gifted and highly committed teachers and staff. We do not impose glass ceilings on children’s learning and we see every child, not for what they are but what they CAN be. All children are encouraged to reach their potential, regardless of their gender, religion, culture, ethnicity and abilities. In order to achieve this, the school is committed to working in partnership with parents in order to put a provision in place around the child that best meets their needs. What do I do if I think my child or young person may have special educational needs? At The Forest Academy we are committed to ensuring that children who need additional support are quickly identified and have their needs assessed and met in a timely fashion. If you think your child may have special educational needs, you should, in the first instance, discuss your concerns with your child’s class teacher, as many problems can be simply resolved and overcome in this way. If you have further concerns you can make an appointment with Mrs Clowrey SENCO so that your concerns can be shared. Initially, an informal meeting would take place – please contact Mrs Helen Clowrey on 01226 284719 to make an appointment. How will school support my child or young person’s learning? Individual plans will be developed for all children identified as having Special Educational Needs by the class teacher and overseen and verified by phase leaders and the SENCO. These will then be shared with parents so that all parties involved are clear as to the intended outcomes of specific provision. These plans are reviewed and updated three times a year. These plans are shared with parents through the two scheduled parent consultation meetings plus an additional meeting in the summer term before transition to a new class. The school assesses all pupils each half term and it is expected that in addition to these assessments, the success of specific provision for pupils with Special Educational Needs will be evaluated and provision adjusted if necessary. Children who assess the SLCN Resourced provision will spend each morning within the provision with a high ratio of adults to children where staff all staff are highly experienced and skilled in speech and language knowledge and strategies. During the morning session the children will receive quality English and Maths lessons in small focussed groups. During the afternoon session the children will access their link classes along with the support of one of the specialist SLCN staff to help the children integrate with their peers. The children will receive daily Speech Therapy sessions from a speech therapist or speech therapy assistant. At The Forest Academy, we believe in the best qualified practitioners working with the children who need the most support. Class teachers are responsible for the educational outcomes of every child and will be directly involved in the teaching and learning of children with SEN. Teaching Assistants will support children with SEN where appropriate and not exclusively. This will take place under the direction and monitoring of the class teacher. How will the curriculum be matched to my child or young person’s needs? The Forest Academy characterises good quality SEN provision as that delivered firstly through ensuring every child has access to quality teaching in every class. It is the class teacher’s responsibility to ensure that planning matches the needs of all learners and success is monitored rigorously in order to determine future planning. 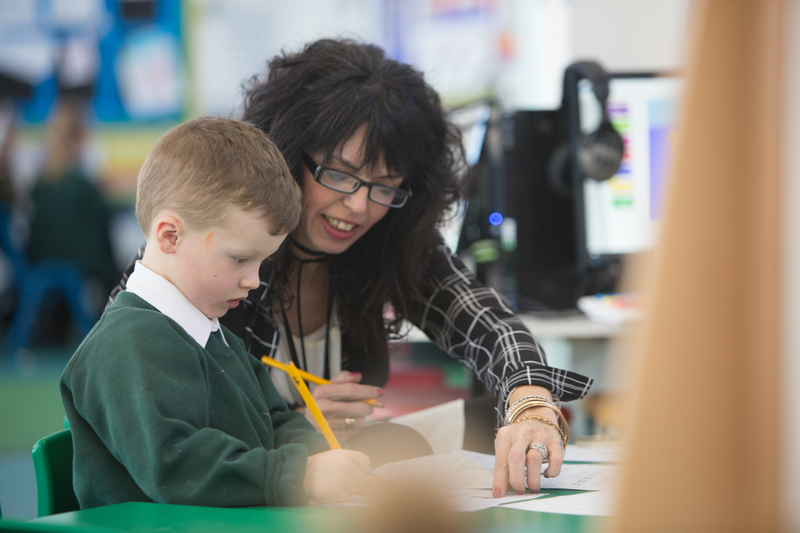 Provision within class sessions may be adapted accordingly through the use of specific resources or the implementation of adult support either in a group or 1:1 to ensure that every child can access the learning. At the point that it is evident that a child’s needs are not being effectively met in this way, interventions will be planned. This may include some additional learning sessions outside of the lesson time or some personalised home learning programs. The school buildings and playground are fully accessible for all children including those with wheelchairs. More specialised equipment and resources are deployed as appropriate to meet the needs of specific children. This may include adaptive furniture, ICT equipment or visual timetables to ensure that children can appropriately access their learning. How will I know how well my child or young person is doing and how will you help me support my child’s learning? The Forest Academy holds parent consultations with every parent twice a year, once in the Autumn Term and once in the Spring Term. Individual plans for pupils with SEND will be shared with parents and discussed in detail at these meetings. There is an additional meeting for parents of pupils with SEND in summer term to review individual plans before transition to new classes. These meetings will set out realistic but challenging outcomes for the children with SEND and clarify exactly what provision the child will receive in school and how support at home can complement this provision. Parents will be encouraged to give their views and contribute to the provision their child’s SEND Support Plan. A one-page profile will be created to support a child with SEND. This will incorporate the views of the child, the parents, and school staff. There is also a culture within our school where teachers will hold formal and informal meetings if there is a concern that has been raised by either the parent or the teacher with regards to the child’s attainment or progress. Under the new code of practice, it is recommended that there are additional meetings with parents who have children with SEND. The Forest Academy will make the decision as to which parents require more frequent meetings between themselves and the class teacher / SENCO to discuss progress. The frequency of these meetings will depend on the child’s specific needs. Where appropriate, the school will provide information sessions to parents of children with SEND; this may be to clarify the systems and procedures that are in place at school or to provide some training on how to support children with specific needs from an educational perspective. Formal reports are shared with all parents at the end of the school year. What support will there be for my child of young person’s overall well –being and social, emotional and behavioural development? The Forest Academy ensures that all staff receive up to date training and that there are designated staff to deal with pastoral care. Senior Leaders support the SENCO, Learning Mentor and Parent Support Worker to ensure that all children feel safe and supported and can access their learning in spite of any pastoral issues. The Forest Academy follows a strict Behaviour Policy and Anti Bullying Policy. This can be viewed on the school website by following the “About Us” and then “School Policies” links. These policies are also accessible from the school office to all visitors and school staff. What services and expertise are available or accessed by the school, including staff with specific specialist knowledge/qualifications? The school has access to a wide range of specialised support and advice from experts on which it can call as appropriate. These include the Local Authority Inclusion Services, Educational Psychologists, Occupational and Speech therapists, School Nurse, health visitors, EWO, CSWS and CAMHs. What training and development is done by staff supporting those with SEND? The Forest Academy ensures that key members of staff are in receipt of up to date training, which will benefit our pupils with SEND. Training for staff is bespoke and matched to the needs of pupils in the school. For example, the SEN Team has recently received training to support identification of needs and provision management. In the new school year several members of staff will receive Elklan Speech and Language training. Staff have access to resources in school which outlines some of the most common disorders; this gives some signs to look out for and how to best support these children in an educational setting in order for them to reach their potential. The SENCO attends regular network meetings to ensure that the school is kept up to date with the latest developments. The Forest Academy ensures that ALL children are able to access school trips and residentials. We carry out specialist risk assessments where necessary and work closely with the settings to ensure that all children’s needs can be met. School uses the EVOLVE system to ensure that systems and procedures around risk assessments are robust and carried out thoroughly. Where appropriate, parents are invited into school and the activities are discussed in relation to the child and their needs. How will the school help children and young people transfer to the next phase of education? The Forest Academy has ever improving arrangements for pupil’s transition to High School. This year, Year 6 pupils took part in a 2- week early transition to their new school. Year 7 leaders visit the school to talk to class teachers about the children with the intention of ensuring continuity of provision. At The Forest Academy, we provide PSHCE sessions which focus on change and the transition to another setting. We recognise that the move to High School is a time of great worry for some children and we do whatever we can to ensure that the move is comfortable and reassuring. Parents are also invited to attend ‘Growing Up and Moving On’ sessions run by the Parent Support Advisor, Sue Galley. This is a free programme of support specifically aimed at the parents/carers of year 6 pupils and is held at Barnsley Academy, which gives parents an opportunity to meet the Y7 Learning Mentor. How are the school’s resources/funding allocated and matched to children’s needs? First and foremost, funding is prioritised to ensure that there is accessibility to the Curriculum for ALL pupils, including those with SEND. This may mean that school needs to purchase specialist equipment and learning resources. Staffing needs to be well considered and children’s individual needs catered for. The Forest Academy often takes the guidance from outside agencies who can offer us expert advice. How are parents and carers involved in the school? The Forest Academy uses many ways of ensuring that parents can be involved in school and are informed about the learning that is taking place not only in their own child’s class but right across school. We use the school website as a way of sharing learning see our ‘Learning Zone’ on the school website. School newsletters are updated weekly and class blogs are regularly uploaded. The school calendar provides parents with key calendar dates and parents are invited to contact the school via the school email info@theforest-academy.co.uk should they have any queries at any point. Parents are welome to come into Forests Celebration Assemblies each Friday at 2.30pm to see and celebrate the children’s learning events throughout the week. If you are interested in applying for a school place for your child, please contact Admissions at Barnsley Council on 01226 773670/ 01226 773689.